I always like to point out emerging or overdone genres within contemporary YA literature. We definitely have seen a surge in the supernatural, in particular vampires (Thank you, Twilight). Then, with the success of The Hunger Games, dystopias of all kinds were springing up on bookshelves. And well, I have a read a ton of them. Some better than others, but after a while, it does get a bit tiring. 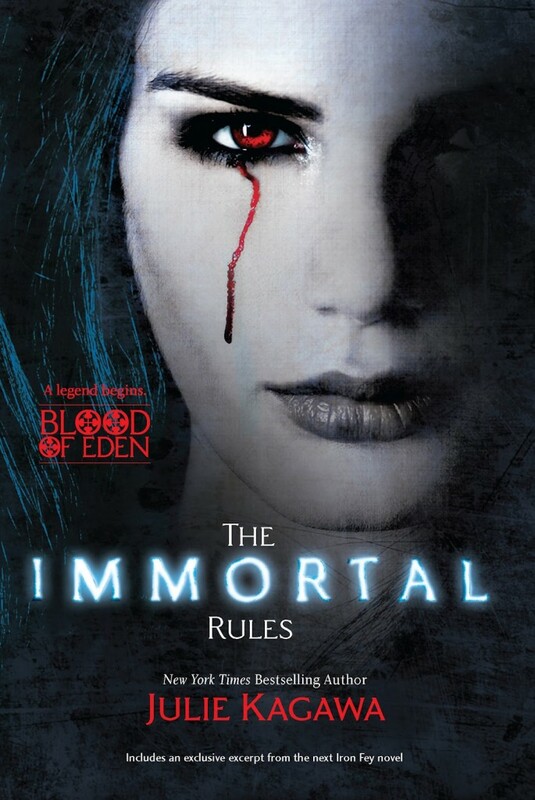 However, when I discovered The Immortal Rules, I was intrigued. It’s a vampire book set in a dystopian world. I can’t say that I’ve stumbled upon any story that before. So I read The Immortal Rules, and besides its slow start, the interesting mix of two popular genres makes it a satisfying read. Allison Sekemoto is living as an Unregistered on the fringe of New Covington society. New Covington is a vampire-run city, and Allie and her friends are humans who don’t want to be used to feed the vampires. Therefore, their status as Unregistereds means that they often starve or must steal in order to survive. During a mission to find food, Allie is fatally attacked, and a vampire gives her a choice of between becoming immortal or dying. On the brink of death, Allie decides to become one of the creatures she loathes so much. Trying to come to terms with herself, her master and his lessons, and the current world around them, Allie must discover who’s worth dying for. Allie as a human was hardly as interesting as Allie the vampire, which means that the first part of this book moved rather slowly. But once she became a vampire and ventures out on her own, the pace picked up and so did my interest. The plot took a few twists and turns that I wasn’t expecting. That was very nice for change, since many of the books I’ve read lately have been pretty predictable. Its unpredictability kept me guessing, as well as my curiosity about this dystopian society. There was also one very fascinating bit that I really hope gets explored and explained in the subsequent Blood of Eden books. Allie was an interesting character because she was so at odds with herself. She kept denying her natural vampire instincts. At times, it was frustrating, but it’s understandable. There’s no such thing as a smooth transition into something you’ve hated all your life. In a way, that’s what made Allie captivating. All in all, The Immortal Rules is a good start to a potentially great series. I feel like there are many exciting and dangerous things in-store for Allie; hence, I can’t wait to see what happens in the next Blood of Eden book! The Immortal Rules by Julie Kagawa is available for purchase in our TYF store, powered my Amazon. Series: The Blood of Eden – Book 1 of ?